1. Patterns of leaf attributes were compared at regional and global scales in relation to the seasonal availability of water. 2. Light-saturated assimilation rate (Amass), leaf mass per area (LMA), leaf density, thickness, life span, saturated water content, chlorophyll, nitrogen and phosphorus content were determined during the wet season for 21 tree species in four contrasting habitats in northern Australia. Rainfall in this area is extremely seasonal. 3. Amass and foliar chlorophyll, N and P contents were positively correlated with each other, and were all negatively correlated with LMA, leaf thickness, density and life span. 4. Deciduous species had smaller LMA and leaf life span, and larger foliar N and P contents than did evergreen species. 5. 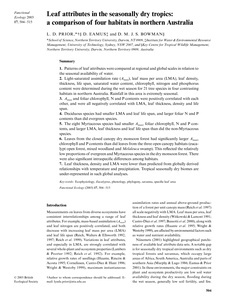 The eight Myrtaceous species had smaller A mass, foliar chlorophyll, N and P contents, and larger LMA, leaf thickness and leaf life span than did the non-Myrtaceous species. 6. Leaves from the closed canopy dry monsoon forest had significantly larger A mass, chlorophyll and P contents than did leaves from the three open canopy habitats (eucalypt open forest, mixed woodland and Melaleuca swamp). This reflected the relatively low proportions of evergreen and Myrtaceous species in the dry monsoon forest. There were also significant intraspecific differences among habitats. 7. Leaf thickness, density and LMA were lower than predicted from globally derived relationships with temperature and precipitation. Tropical seasonally dry biomes are under-represented in such global analyses.